Pilgrim at Tinker Creek is the story of a dramatic year in Virginia's Roanoke Valley. Annie Dillard sets out to see what she can see. What she sees are astonishing incidents of "beauty tangled in a rapture with violence." Her personal narrative highlights one year's exploration on foot in the Virginia region through which Tinker Creek runs. In the summer, Dillard stalks muskrats in the creek and contemplates wave mechanics; in the fall, she watches a monarch butterfly migration and dreams of Arctic caribou. She tries to con a coot; she collects pond water and examines it under a microscope. She unties a snake skin, witnesses a flood, and plays King of the Meadow with a field of grasshoppers. The result is an exhilarating tale of nature and its seasons. 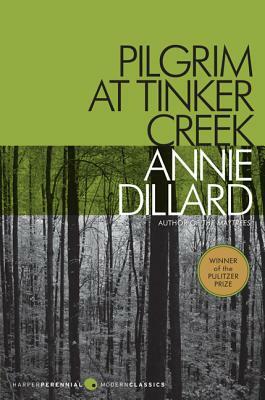 Annie Dillard has written twelve books,including in nonfiction For the Time Being, Teaching a Stone to Talk, Holy the Firm, and Pilgrim at Tinker Creek. She is a member of the American Academy of Arts and Letters and the American Academy of Arts and Sciences.